You'll find plenty of places to visit near Noosa: Maleny Botanic Gardens & Bird World (in Maleny), Mooloolaba (Scuba & Snorkeling, Mooloolaba Beach, & more) and Artworks in Clay by Anne Gentry-Smith (in Montville). 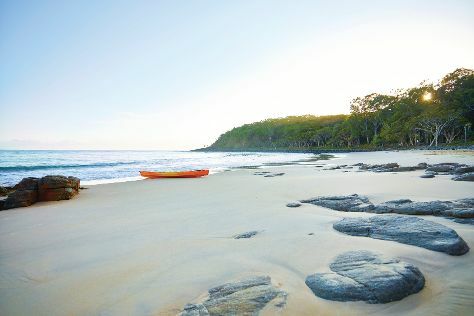 Spend the 20th (Wed) exploring nature at Noosa National Park. There's lots more to do: stroll through Noosa Main Beach, wander the streets of Hastings Street, learn about wildlife with up-close encounters at Australia Zoo, and kick back and relax at Kings Beach. Find out how to plan Noosa trip without stress by asking Inspirock to help create an itinerary. If you are flying in from United Kingdom, the closest major airports are Brisbane International Airport and Gold Coast Airport. Wrap up your sightseeing on the 25th (Mon) early enough to travel back home.